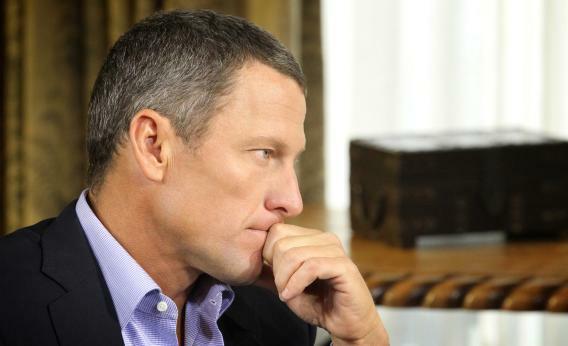 Lance Armstrong-Oprah Interview: Disgraced cyclist admits to doping for all 7 tours. Photo by George Burns/Oprah Winfrey Network via Getty Images. Part one of Lance Armstrong’s much-hyped doping confession to Oprah Winfrey is in the books. (Part two airs Friday night.) The biggest takeaway—that Lance did indeed dope despite vehemently denying he did for more than a decade—leaked some time ago, and the entire interview’s early buzz had faded somewhat over the past two days given the much more surprising sports story currently unfolding in South Bend involving Manti Te’o and his literally unreal dead girlfriend. Still, even though we knew the broad strokes of what Lance was going to say, it was nonetheless interesting to see how he decided to color within those lines, along with what parts of the picture he’s still leaving blank. Oprah may have been the one asking the questions but it was evident that Armstrong still had his fair share of control, on more than one occasion ducking topics in what had been touted for days as a “no-holds-barred” interview. Winfrey struck a relatively friendly tone but she did kick things off with a series of specific yes-or-no queries, during which the disgraced cyclist admitted to using performance-enhancing drugs—including EPO, blood transfusions, and testosterone—for all seven of his since-revoked Tour de France victories. “I viewed this situation as one big lie that I repeated a lot of times, and as you said, it wasn’t as if I just said no and I moved off it,” Armstrong said. He also said that, in his view, it would have been impossible to win the race seven times without doping given the PED culture that dominated the sport during his career. From there Armstrong appeared to swerve, however briefly, from the road of guarded confession toward something else. He claimed that his seventh and final win in 2005 was the last time he used banned substances. “The accusation that I doped after my comeback was not true,” he said, referring to his short-lived return to the sport that included an impressive third-place finish in the 2009 edition of the Tour. It would also mean there was some type of ironic karmic justice at work because Armstrong told Oprah that if he hadn’t returned to the sport he believes he would have gotten away with his years of cheating. “We wouldn’t be sitting here if I didn’t come back,” Armstrong said, suggesting that it was his decision to end his first retirement that set off a series of dominoes that ultimately led a number of his former teammates to testify against him. Asked toward the end of the night’s segment whether he’d be willing to help clean up the sport of cycling, Lance said that wasn’t something he could take the lead on given his history of doping and denials. “I’ve got no cred,” he said. This post, originally published at 9:21 p.m., has been updated with additional analysis, and information as it became available.